The name 'Hot Dogma' is no more. The lovely restaurant on Oliver Avenue has finally been forced to change its name. Damn you American Legal System! To mark this day, the owners threw a mock funeral for the old name and introduced the new one. Most of the ladies attending put on their finest mourning finery and the male attendees wore somber suits. 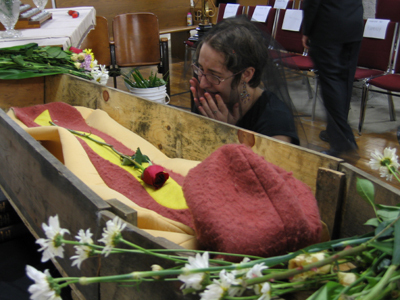 There was even a coffin containing the retired hot dogma mascot costume. Were were entertained by a string quartet and a rock ballad about Hot Dogma's losing legal battle. After the funeral, Tim and Meg announced the new store name, 'Franktuary', and we were treated to a buffet, a concert, and piñata filled with gummy hot dogs.